In the sweltering heat of summer, patbingsu, or shaved iced with red beans, is a popular treat. The most classic type of bingsu, which refers to desserts made of shaved ice and condensed milk completed with various toppings, patbingsu looks like a white mountain with burgundy lava. Patbingsu’s overall taste is sweet, as the red beans have been simmered with sugar for hours and milk is used to make the shaved milk. The pleasure comes from the unexpected clash of textures. While the red beans are mushy, the ice quickly melts in the mouth. The heat relief from the chilly contents go without saying. Over the years, more bingsu varieties have been introduced, such as wine bingsu and green tea bingsu. But injeolmi bingsu is perhaps the most notable among them. Injeolmi refers to bean powder-coated rice cake. Injeolmi bingsu uses the bean powder as a topping. 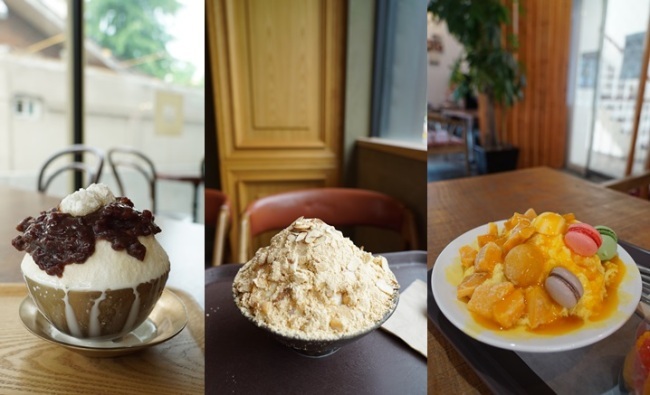 Some might find it hard to breathe while dining on injeolmi bingsu, as the powder can be easy to choke and cough on. But finding the small rice cake in the ice pile is a pleasant surprise. When introduced around five years ago, injeolmi bingsu proved to be a sensation, with people lining up in front of the stores. Sulbing, the bingsu franchise behind the trend, has even made its way to China and Australia. As the fresh tropical fruit would be pricey in Korea, frozen mangos are often used to make bingsu. Chewing the icy mango, one comes to understand what brain freeze truly means. To take the sweetness to another level, mango puree is poured over the bingsu. Just a couple decades ago, many households owned an ice shaver for making bingsu. But as there are now plenty of bingsu franchises, people usually go out for the sweet icy treat. In summer, many forgo coffee or tea and instead like to delve into a bowl of bingsu after a meal.